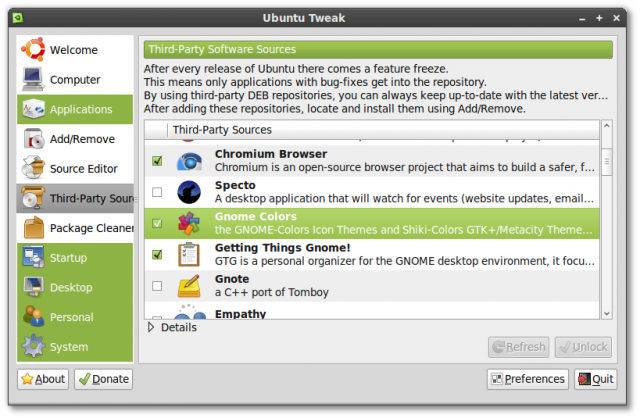 Ubuntu Tweak 0.4.8 is released. It doesn’t seem to have introduced any new features, but it have improved the Third Party Sources. The number of PPA source from launchpad.net is increasing. A lot of new and updated applications have their PPA source, it’s really useful for users. Ubuntu Tweak includes a lot of popular PPA sources to let people to use PPA easily. But there’s one problem, one source may depends on anther, and one may conflicts with another. How do we solve the problem? So in the Ubuntu Tweak 0.4.8, it has been a major improvement. For example, if you want to use the latest version of Midori (A lightweight browser), it depends on the WebKitGtk source. So the new Ubuntu Tweak will notify you about it like this, if you choose “Yes”, both “WebKitGtk” and “Midori” will be enabled. It’s the easiest way to do it, isn’t it? 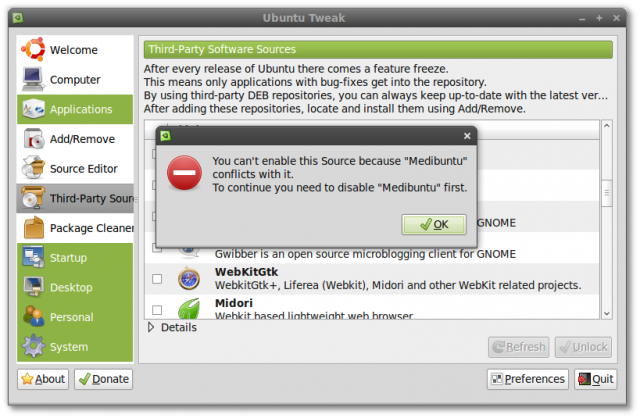 On the other hand, if you disable “WebKitGtk” without disabling “Midori” first, you will get a warning dialog like this. 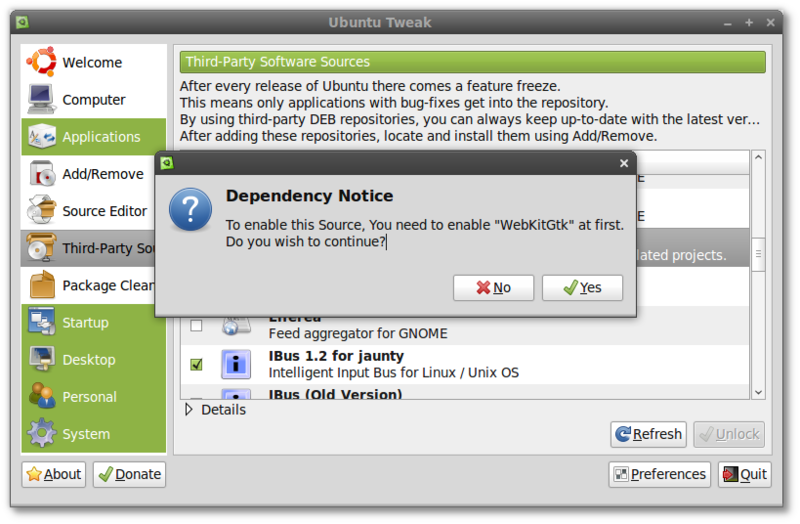 Another warning dialog will show when you try to use a source that conficts with an already enabled source. For example, “Skype” and “Medibuntu” both provide the Skype application. To make everything go well, You won’t be allowed to enable both of them. 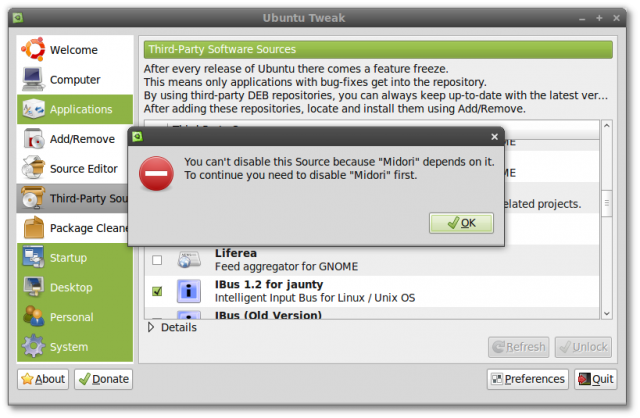 Your system will be much safer and stable through Ubuntu Tweak’s new Third Party Sources.